Mary has devoted her 35-year career to improving patient healthcare throughout the Southeast. She has worked with more than 700 hospitals and clinics and helped lead large healthcare organizations including the American Heart Association, John Hopkins Hospital, and Emory Healthcare. She hopes to bring “more efficient, more effective, and more patient-centered health care” to Georgia. HEALTHCARE – Mary wants to expand the availability of Medicaid to assist struggling hospitals to serve their communities. She also will strive to provide more jobs funded by Federal Medicaid reimbursements to Georgia (specifically North Fulton) and aim to expand telemedicine opportunities to provide affordable care. She will also review the Georgia regulations for health insurance company policies with regards to Emergency Room payments. EDUCATION – Mary is a strong advocate for reworking the 30-year school district funding program and increasing equity in funding. She plans to work toward a statewide anti-bullying program and to expand funding for vocational training programs which include training requested by local businesses. TRANSPORTATION – Mary hopes to reduce commute times and enable cities like Roswell to provide innovative transportation solutions to their citizens at a lower cost in a shorter time. She also will aim to open up new financial support for other environmentally friendly sources of transportations throughout the district like walking and biking paths. GUN SAFETY – Mary supports background checks for all purchased guns and the elimination of current loopholes for purchasing firearms such as gun shows and online purchases. She will fight to ensure that those on the federal “no-fly” list are not able to purchase a gun and hopes to eliminate the sale of high-capacity magazines. Georgia women like Mary are making history in this midterm election cycle as they run for seats long held by Republicans. 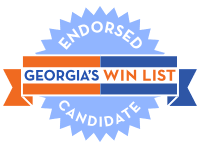 With women in record numbers on the ballot this year, WIN List needs your help to elect these women and train the candidates we want to see on the ballot in 2020 and beyond.